Being the ripe old age of twenty, I feel entitled to criticize what “kids these days” are into. Some of these trends are difficult to understand, despite the fact that sometimes I am a participant. Taylor Swift’s new album is heavily influenced by her target demographic. So, in order to understand “1989”, we must understand what teenagers are interested in. “Kids these days” are obsessed with the past. However, this obsession only goes so far. For example, young people love making their Instagram posts look old and worn, but they can’t be bothered to load real film into a camera. They love listening to music from the 1980s, but wouldn’t know how to fix a cassette if the tape came unwound. I know all of this because I am involved with this movement. So, here we have a record released in 2014, being created as if it were produced in the 1980s. The songs reject modern pop tropes, instead channeling classic pop music as inspiration (hence the album’s title). Even the record’s packaging reeks of nostalgia. 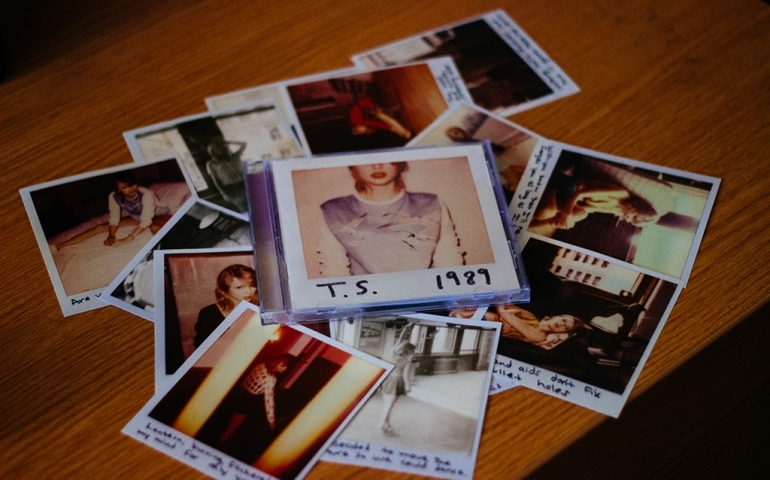 Every copy of the CD comes with thirteen “photos from Taylor”, which are simply pieces of glossy cardstock featuring faded and scratched pictures of the singer. While I was writing this review, it was announced that “1989” had already become the top selling album of the year, as well as having the largest sales week for any album since 2002. Granted, “1989” had quite a bit of hype built up around its release. However, I believe the massive surge in sales can be attributed to the fact that Taylor Swift has created an outstanding record. Each song is catchy and unique, full of the pounding synths and cheesy one-liners one would expect from an eighties throwback album. The lyrics don’t stray far from the typical love-and-loss style that Swift is known for. However, compared to previous albums, the artist takes a much less direct approach to her songwriting. Instead of writing deeply personal and direct songs, she instead creates lyrics that are more vague and poetic. Complementing this is the instrumentation, which gets its unique face from the artist’s new-found love for days past. To be extremely brief, “1989” is a beautiful pop record. While the songs sound great now, my thoughts always drift back to how an album from 2014 that glorifies the 1980s fits into our culture. Why are young people rejecting crisp digital images and multi-instrumental pop music in favor of recreating grainy film and listening to much simpler tunes? While kids from the 80s were obsessed with the future, we find ourselves today obsessed with the past. It is almost as if time is a mirror, with each side wishing for what it can’t really have. Decades from now, when today’s albums are faded and scratched, lying dormant in a dusty bin at a thrift shop, where will “1989” be?